Nick Bullock and Andy Houseman spent the autumn in the Hongu Valley in Nepal attempting the fantastic looking peak of Chamlang (7,314m). Ultimately, they got shut down by cold temperatures and high winds that plagued many teams in autumn 2012. Andy Houseman has given us a great write up of the trip below, and a full expedition report can be found by following the link at the bottom of the page. 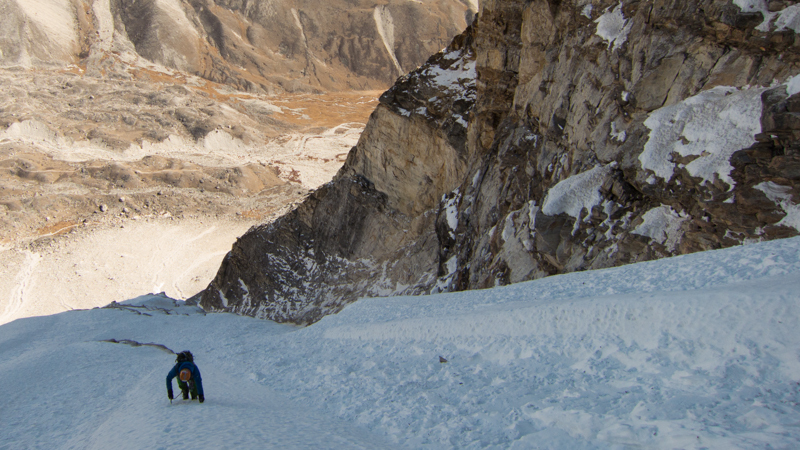 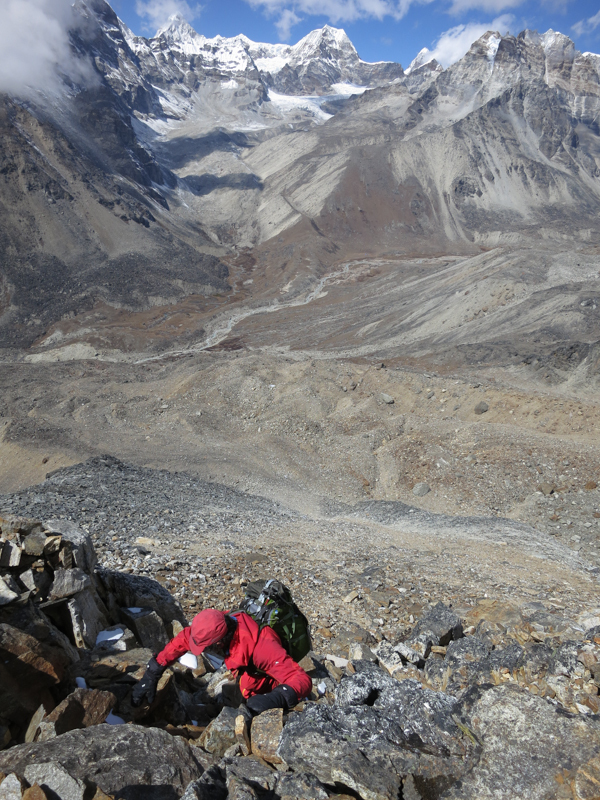 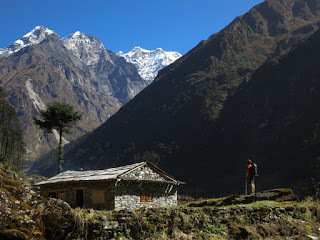 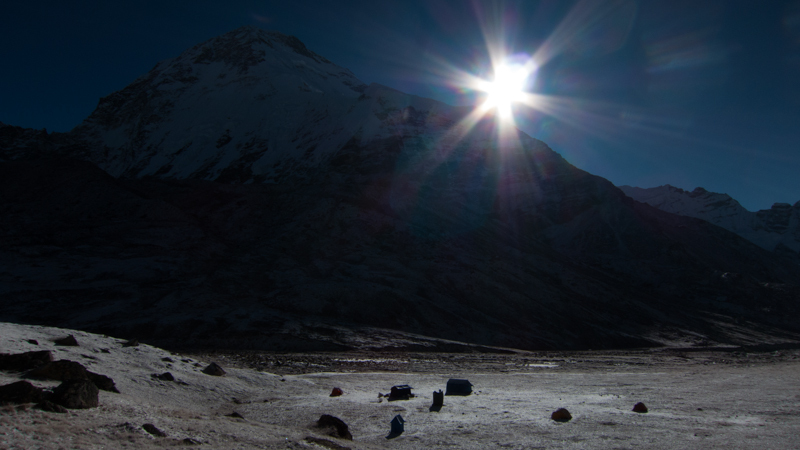 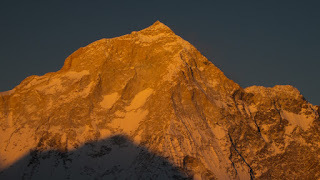 I’m just fresh back from spending five weeks sat below Chamlang in the Hongu valley, Nepal with Nick Bullock. 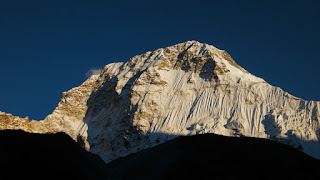 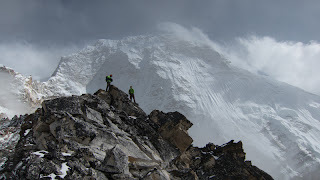 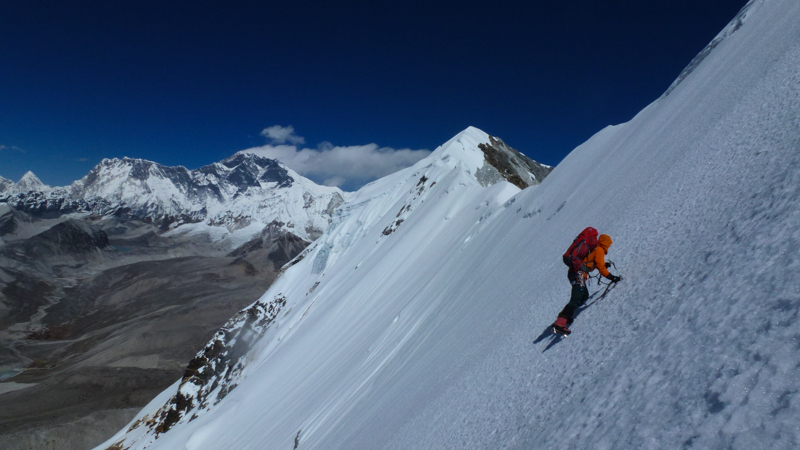 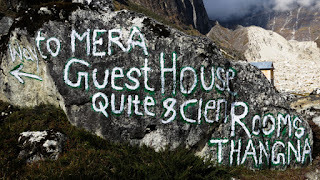 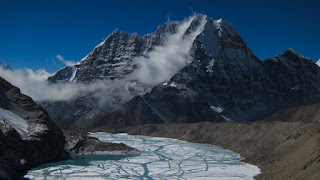 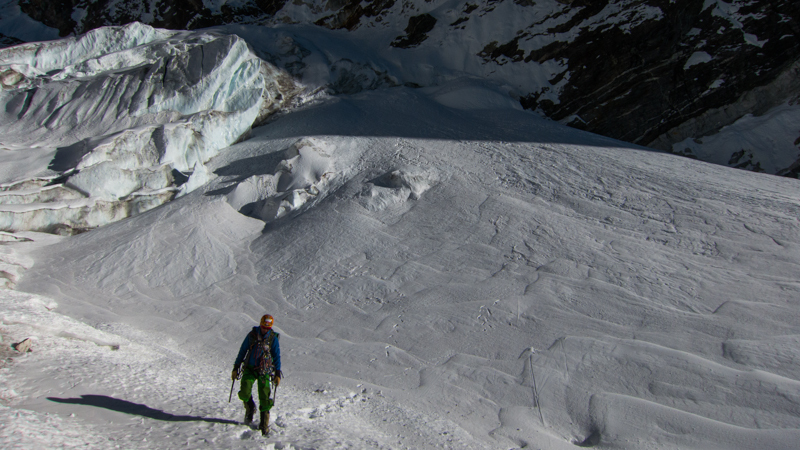 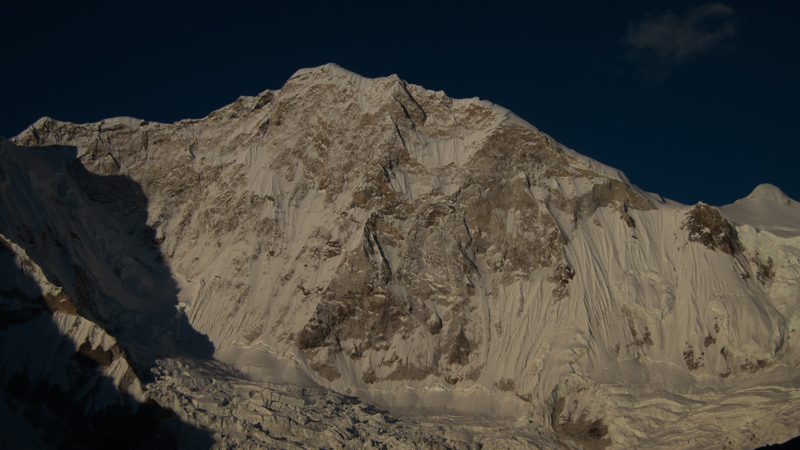 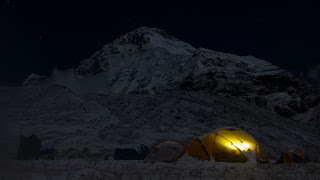 Unfortunately (again) the weather didn’t play ball and we never got to have a proper good go at our objective for the expedition – the North Face of Chamlang, last year on Kyashar in the spring it was snow, this year it was the wind. 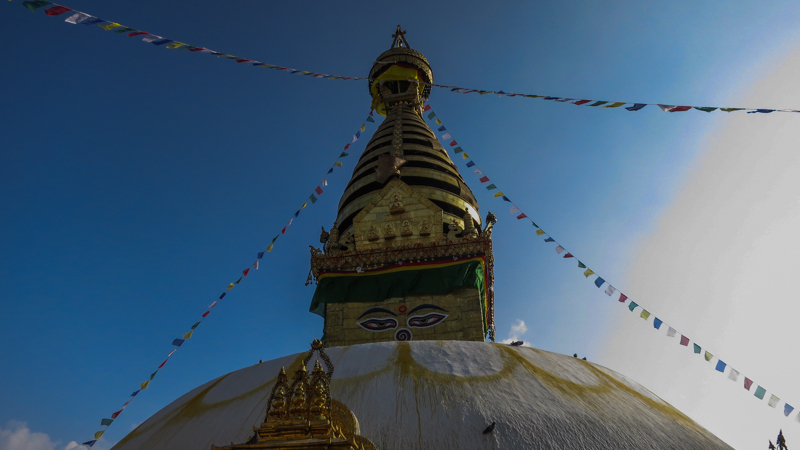 We left Kathmandu on the 4th October along with Jack, Rob and Graham and made it to Lukla without incident where we met up with Gary, Tania and our amazing base camp team – Buddi and Santosh before the we all started the 8 day trek into our base camp in the Hongu Valley. 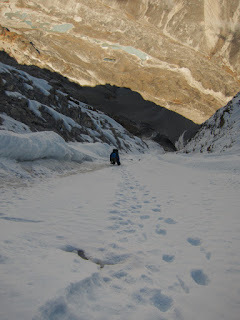 The route takes you out of Lukla and up over the Zatrwa La pass before dropping down into the Hinku valley and following this up to Khare and over the Mera La to finally drop down into the Hongu Valley and out base camp. With Peak 41 (Jack and Rob) to one side, Chamlang to the other and Hunku (Garry and Graham) just up the valley it was a pretty perfect location. 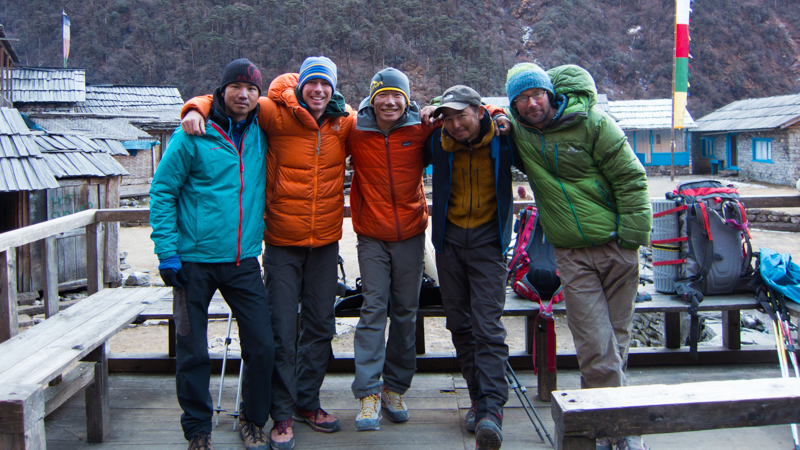 We spent the first couple of weeks acclimatizing around the Hongu, exploring the valley – which was stunning and scoping out the North Face and possible routes. 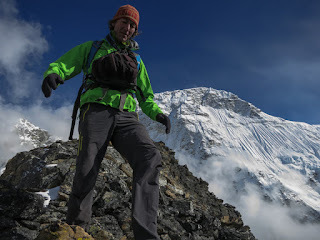 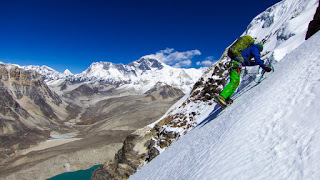 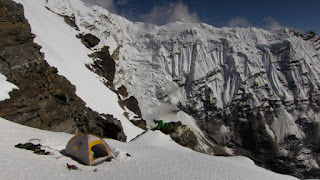 After a few days of heading up to around 5700m we were keen to sleep high so headed up with Jack and Rob to the West Col on Baruntse to spend a night at just over 6000m with stunning views across to Makalu. 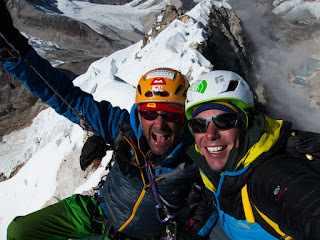 With Chamlang at 7314m Nick and I were keen to get a bit more height before having a pop at the face so decided on getting as high as possible on the West Ridge which was also a possibility for our decent route. First climbed by a Japanese team in 1986 it took us a couple of days just to figure out the best way to get onto it, eventually finding a load of abandoned gear and guessing we were on the right track. We set off with 3 nights of food and figured we’d just go as high as possible without tiring ourselves out too much so headed back up the never ending scree slopes below the ridge for a third time. 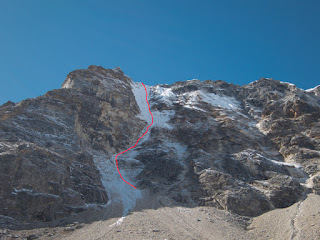 The start to the ridge is pretty horrible, very loose and not the most enjoyable but we slowly made our way up passing more old fixed ropes and even a ladder which we avoided by some easy scrambling a few meters to the side?! 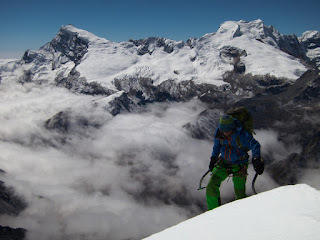 Having bivi’d just below the snow line at 5800m the next morning we headed up to the first summit on the ridge at around 6100m from where we’d intended to carry on. To cut a long story short the ridge ahead was a lot more crevassed and corniced than it had looked and would have taken a lot of time and effort to get across the horizontal section to get not that much higher than we were – very doable and an amazing objective but more involved than we wanted for acclimatisation! 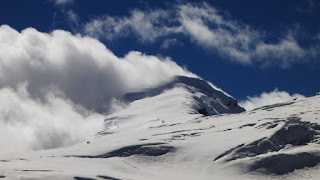 With that and the fact that the slopes coming down from the summit looked to be dangerously loaded which ruled it out as a decent option we decided to spend the rest of the day where we were hanging out in the afternoon sun, stay there that night and head back to BC the next day. 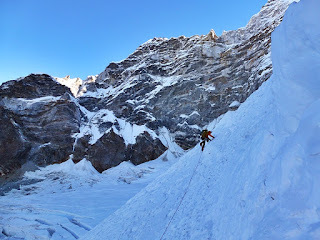 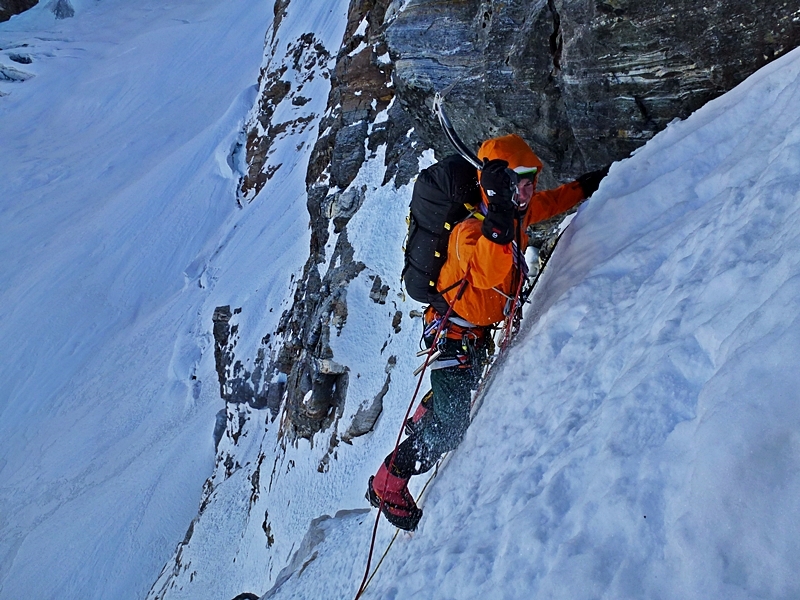 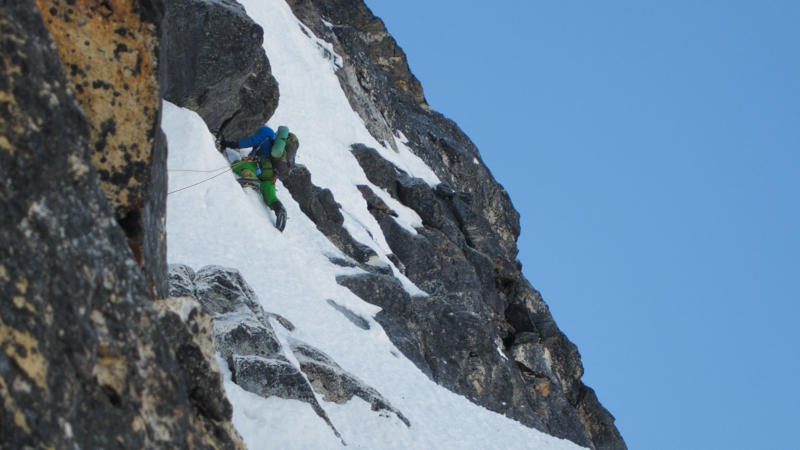 The face seemed to be in perfect condition – steep neve, one swing axe placements, the weather stable and we were feeling pretty acclimatized. 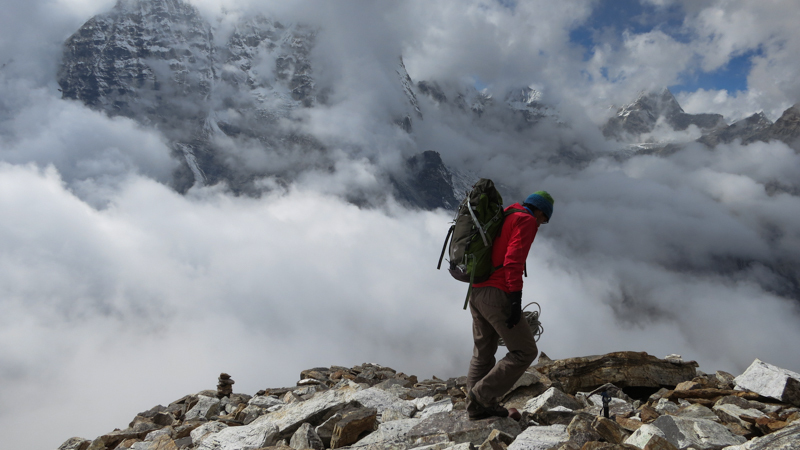 But then we met the wind. Well we didn’t so much as meet it as low on the face we were sheltered from it but started getting hammered by the spindrift it was creating and could see massive plumes of snow being blown out just above us where the angle changed and just where we’d be digging in for the night – it didn’t exactly look inviting! 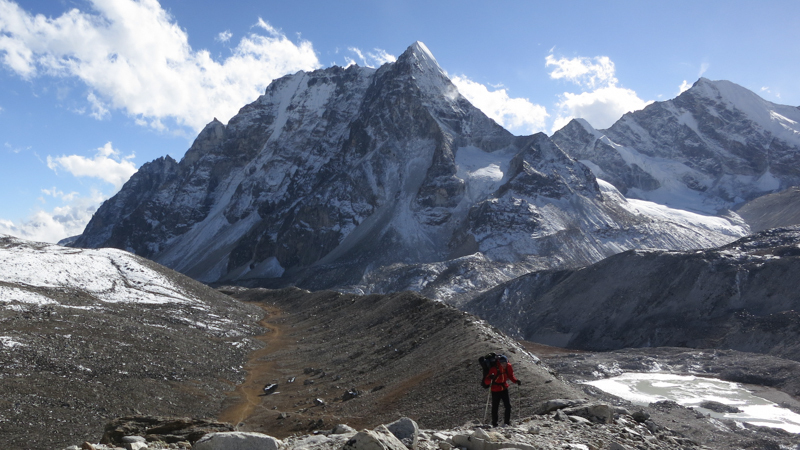 Having bailed from the first attempt we phoned home for a forecast from BC and didn’t get the news we’d wanted – extremely cold and gale force winds. 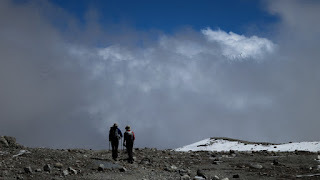 And the same again when we optimistically rang every few days for the next couple of weeks, by the time we left they were up over 100 kph blowing straight across the face and had rarely dropped below 70 kph at 6000m. 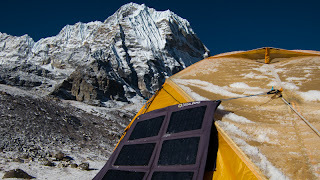 There were a couple of days when there was a lull in the wind and eager to get something done we used one of these to make the possible first ascent of a mountain called Hunku, 6119m, which had been Garry and Grahams objective and what we had originally planned to acclimatize on. It’s not the most attractive peak I’ve ever seen, in fact as you walk up the Hongu Valley under the East face it looks like choss, a mixture of scree and big loose buttresses. 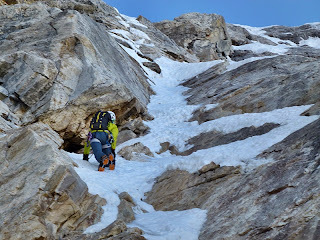 But half way along like an oasis in the middle of a desert there is a continuous broad couloir of snow leading straight up to the summit – the line Garry and Graham had tried but been turned round by deep, unconsolidated snow. 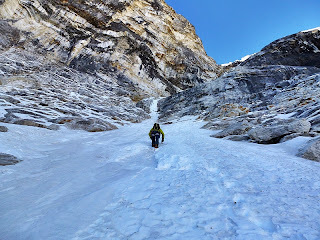 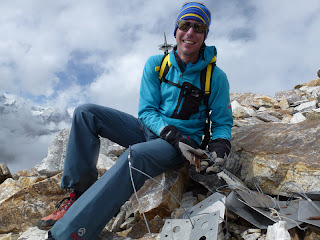 Fuelled by the hope we’d eventually find the same neve we’d found on Chamlang we left base camp at 5am and after a 2.5 hour approach floundered through the deep unconsolidated snow for another hour to reach the first steepening and thankfully bomber neve. Hunku, 6119m – much nice looking mountain when seen from the North, the summit is actually at the far end of the horizontal ridge not the nice pointy bit at the nearest end! The climbing wasn’t at all technical – just really fun and enjoyable (the way it should be! 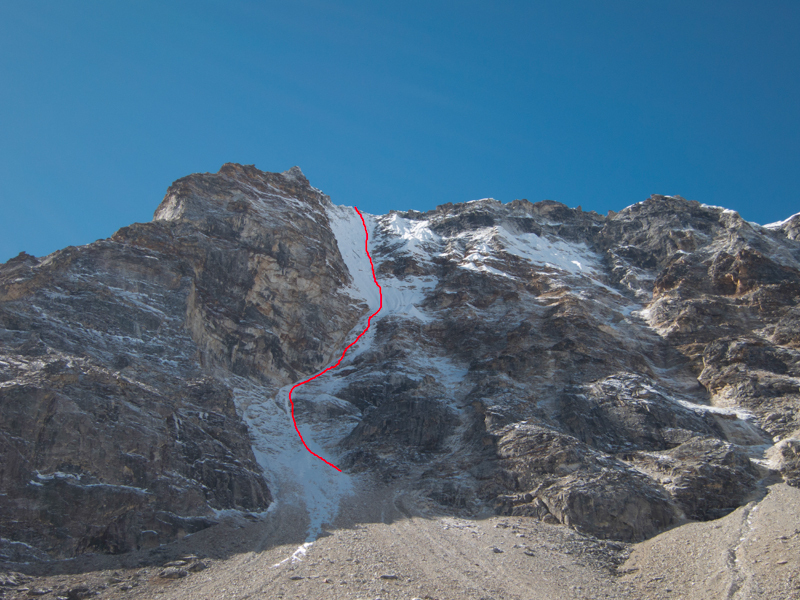 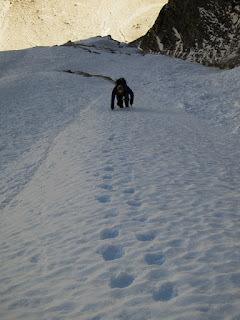 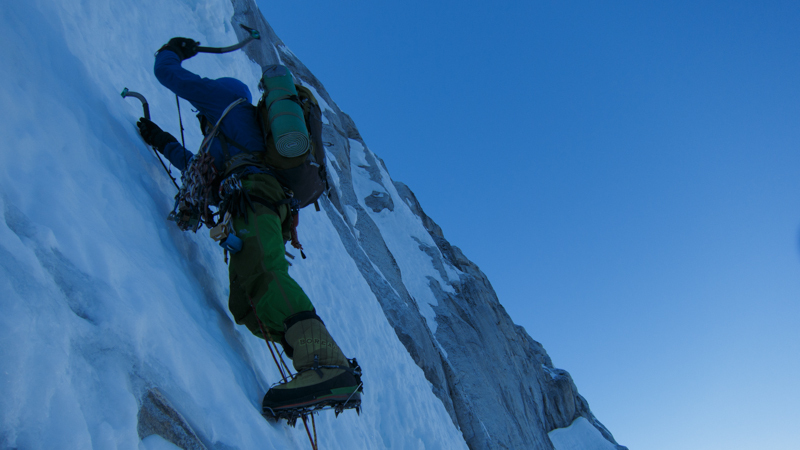 ), a couple of short steeper sections lead to the final fluted section where we belayed one pitch of ice to avoid some bad snow before the final flutings lead straight up to the summit of Hunku. 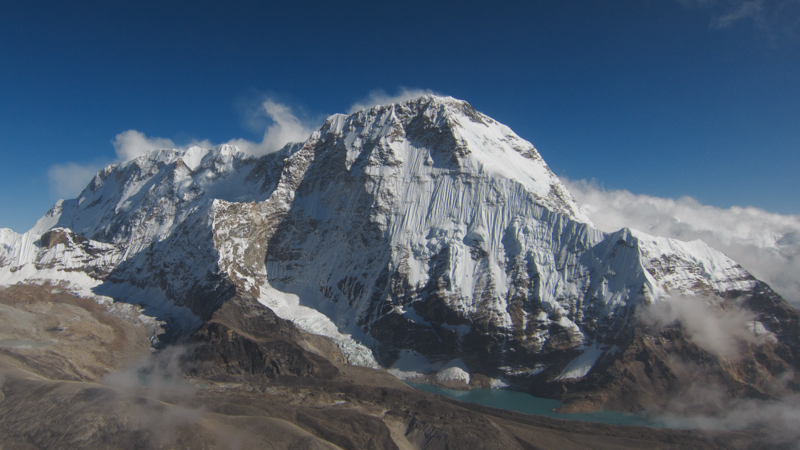 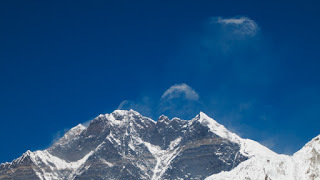 The views from the summit were simply stunning – the whole Khumbu to the West, Everest – Lhotse – Nuptse to the North, Baruntse – Makalu – Hongo Chuli to the East and Chamlang to the South. 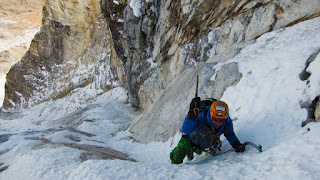 The couloir was around 600m – think a shorter/easier version of the Swiss route on the North Face of Les Courtes. 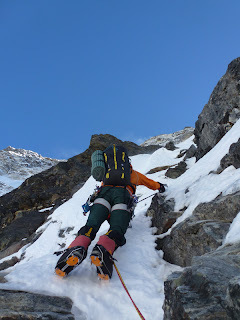 We descended the route on ice threads and rock gear lower down and 16 hours after leaving were back in base camp with big smiles (mine bigger than Nicks as he’d managed to forget which boulder he’d hidden his trainers under, opps!) and sitting down to an evening meal of Momo’s and chips. 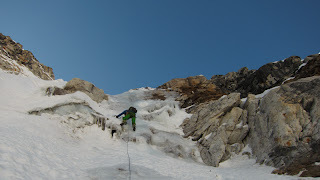 It really was a great day out. 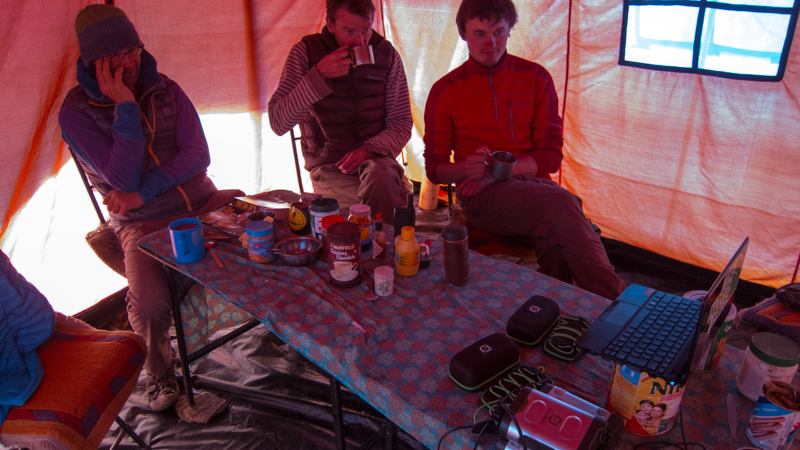 Phoning home for another forecast we were given the same uninspiring news – extremely cold/gale force winds from the West for at least the next week – we decided to bail early having spent 34 days at base camp. 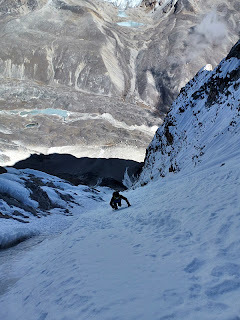 To be honest I felt a bit dejected and disappointed on the way out, thinking of it as another unsuccessful expedition to Nepal but then you have to kick yourself a bit and think – OK we didn’t climb Chamlang or push ourselves and suffer as we’d expected but climbing to an untouched summit in the middle of some of the most spectacular scenery in the world – it’s pretty special. Crossing the Mera La and dropping back down into the tropical warmth of the Hinku we met up the the three Japanese climbers who had just made the first ascent of the South Pillar on Kyashar – one of the proudest line in the area and a route I’d been to try twice but bad luck had always intervened and I’d never made it onto the upper pillar. I was really psyched these three very talented but modest guys had bagged the line, it sounded amazing hearing their stories about the week they’d spent on the route (in warm temperatures and no wind… guess we were on the wrong hill! 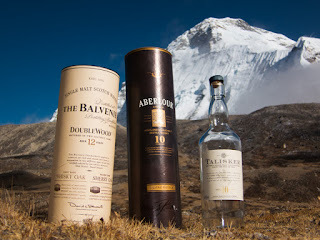 ), definitely the ascent of the Autumn so far for me. The psyched Japanese team after making the first ascent of the South Pillar of Kyashar – good effort boys! 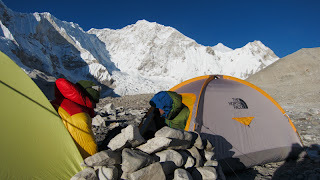 And finally – how to survive 5 weeks at a base camp…. 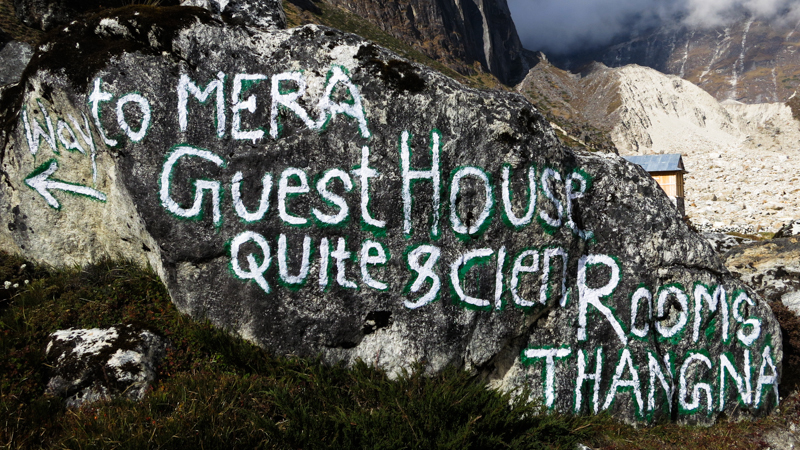 And finally Loben Expeditions for organising another perfectly run trip and providing the two best cooks in Nepal – Buddi and Santosh!